Earlier this week, the Horde completed phase one of the Isle of Thunder. I enjoyed what I saw of phase one, but the Horde needed a base on the island itself! When I showed up for my dailies that day, there was a single quest instead of dailies. This quest queued me for a solo scenario that tasked me with flying to the island, locating a Zanadalari outpost protected by a magic barrier, slaying the Zandalari inside, and taking down the barrier. It was a great of telling a story! You can watch me go through it in the video above. With the Zandalari threat removed, Lor’themar was able to set up an outpost in the northwest section of the Isle of Thunder called the Dawnseeker Promontory. My favorite part? Well, my good friend Uda the Beast! Uda the Beast was the Sunreaver innkeeper in Dalaran. I spent a lot of time with her during the War in Northrend because I loved her two wolves! I helped her evacuate with many other Sunreavers during the purging of Dalaran, and luckily she escaped with her wolves! Now she’s the innkeeper in Dawnseeker Promontory on the Isle of Thunder! 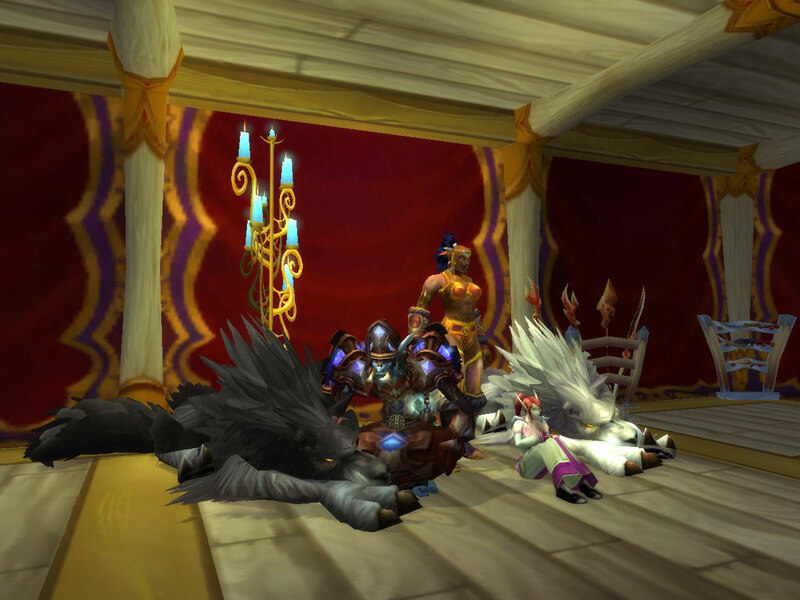 You can see Mooglegem and me spending some quality time with her and her lovely wolves!